Snapdeal is an internet market place that exists for just a few years, but they now have over five thousand employees and offer over twenty million different products. Snapdeal's assortment is carefully divided in many different categories and sub-categories. You can find all kinds of electronic devices, shoes, watches, clothes and even expensive jewelry. This is a very safe market place and the site is very easy to navigate on. Why makes Snapdeal popular and distinctive from the rest of similar markets. They are secure, which is great. Your payment is always protected, so you do not have to worry about losing money. They also have a seven-day-return offer, which is pretty good. Delivery is on time and products arrive in good shape. Snapdeal delivers their products all over the territory of India, and at the website you have an option to track your order until it arrives at your home address. Another thing that differs them from the others is that you can find many authentic products in their online store. You would be surprised by some genuine products with big quality and yet with relatively cheap prices. You can also find some good fashion brands such as GAS, Hidesign or Vero Moda. If you are more into electronics, you can check a great selection of brands such as Samsung, Acer or JBL. Also all products are accompanied with several pictures and a detailed specification of the product. You can read reviews and customer feedback and also compare product prices. Snapdeal also regularly runs different discounts on certain products, and they also have daily promotions with which you can additionally save more money. They accept all the major payment processors such as net banking, credit and debit cards, as well as cash-on-delivery. Another good feature is creating a shortlist and saving the products that you like on the list to check out or buy at a later stage. You can also personalize some of the items or look at products that have been recommended according to your taste. 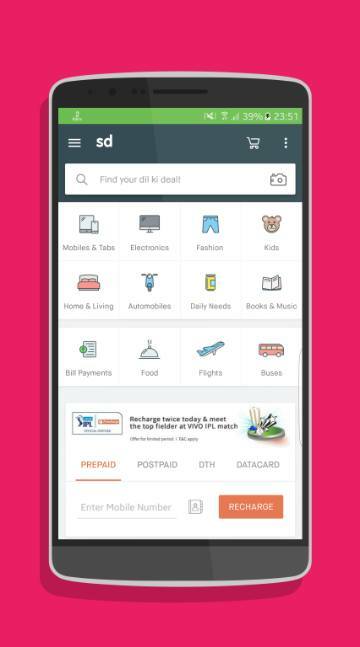 Snapdeal can really make your life easy, as it expanded their services and now also offer you the possibility for paying utility bills or recharging online through FreeCharge. You can pay invoices for mobile phones, recharge your prepaid bill or pay the electricity bill in a matter of a few seconds. If you save your account details, you will have a better online experience next time you come to the website. Discounts and promotions are running daily and there are even some cash back offers. When you order certain product you have the option to test it for seven days and if you are not satisfied you can return it back or replace the item. Also another positive thing is that you have the possibility to cancel your order if you change your mind at any time prior it gets delivered. Snapdeal app also has a great help center where you can find every information about anything you are interested regarding their store. Start using Snapdeal and you will see all the benefits it has to offer. 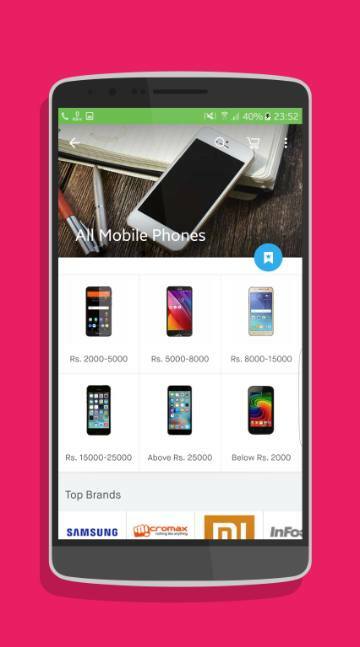 Snapdeal app make all this features easy to use with a smartphone. Try out the Android app now.